Hol dir mit dem Year 4 Pass die 8 kommenden Operator des vierten Jahres und vieles mehr! Hol dir den Year 4 Pass vor dem 4. März 2019 und erhalte das charakteristische Vulkan-Waffen-Design. 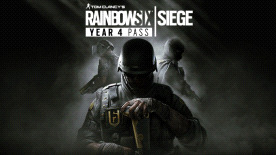 Inhaber des Year 3 Pass erhalten zudem bei Kauf des Year 4 Pass 600 R6-Credits als Bonus. SUPPORTED VIDEO CARDS AT TIME OF RELEASE: GeForce GTX 460 or better, GTX 560 or better, GTX 650 or better, GTX 750 or better, or any card from the GT900 and Titan Series, Radeon HD5870 or better, HD6870 or better, HD7770 or better, R7 260X or better, or any card from the R-300 series and Fury X. Laptop models of these cards may work but are not supported. These chipsets are the only ones that will run this game. Additional chipsets may be supported after release. For an up-to-date list of supported chipsets, please visit the FAQ for this game on our support website: http://support.ubi.com. Game contains FairFight (https://www.gameblocks.com/products) and BattleEye (https://www.battleye.com/) anti-cheat technology.